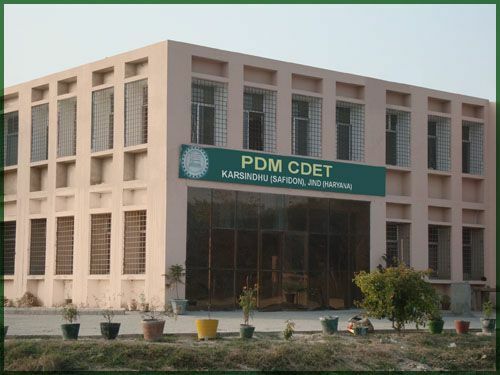 PDM College of diploma engineering & technology is situated in 5 acres of green scenario land, having building and infrastructure facilities as per the norms and standards of AICTE. new delhi ans haryana state board of technical education , panchkula. the institute is well equipped with latest laboratories facilities, computer center, treasure trove of books in library , spacious seprate hostels with all neccessary amenities for boys and girls. besides this the campus encpmpasses spots complex and canteen. the institute provides transportation facilities to commute to and from institute to panipat and jind by buses owned by PDMREA institutions . PDM College of diploma engineering & technology is recognized by the apex body controlling education in india i.e all india council for technical education (AICTE) and affiliated to kurukshetra university, kurukshetra.